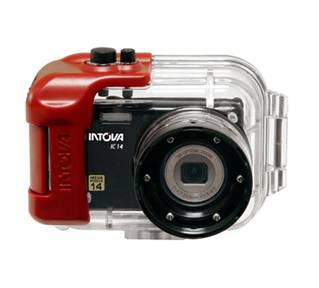 The IC14 is Intova’s newest digital camera that features a 1/2.33” 14 megapixel CCD image sensor for high resolution photography, 1/2000th second fast shutter speed and an enhanced Digital Signal Processor. This model is ideal for capturing fast moving subjects underwater. With up to 720p HD video resolution, the IC14 provides for exciting and fun opportunities in capturing action and adventures. Other camera features include 5X Optical Zoom / 6x Digital nZoom, 2.7” LCD and Lithium ion battery that does not require removal for recharging via USB cable. The IC14 uses SDHC memory cards up to 32 GB (not included). The newly designed sleek external housing is waterproof to 180 feet/54 meters and features dual O-rings to provide extra leak protection and 52 mm lens barrel thread that allows for addition of filters and other accessories. 1) Image sensor: 1/2.33” CCD sensor (14.0 megapixels). 2) Image resolution: Still image – 14M (4288×3216), 8M (3264×2448), 4M (2304×1728), 2M (1600×1200), VGA (640×480). Video – HD (720p)/30fps, VGA (640×480)/30fps, QVGA (320×240)/30fps. 3) LCD monitor: 2.7” full color TFT LCD (230K pixels). 4) Recording media: 32MB internal memory (23MB available for image storage), supports SD/SDHC memory card up to 32GB (optional). 5) Lens: 5x optical zoom. Aperture range: 2.8(W) – 6.5(T). 6) Focus Range: Macro: 0.2m/7.9 inches~Inf (W), 0.6m/23.6 inches~Inf (T). Normal: 0.6m/23.6 inches~Inf (W), 1m/39.4 inches~Inf(T).